Red Oval Shaped Fancy Wire Wrapped Lampwork Beads accented with Lite Siam Swarovski Crystals beautiful gift stunning handmade dangling necklace inspire everyone so beautiful oval wedding cake bead dangling with Swarovski Lite Siam crystals with daisy spacer silver designed chain necklace attractive design unique trendy different from others necklace latest fashion handmade painted glass beads with genuine Swarovski crystals. This necklace is a great gift to female friends & relatives. 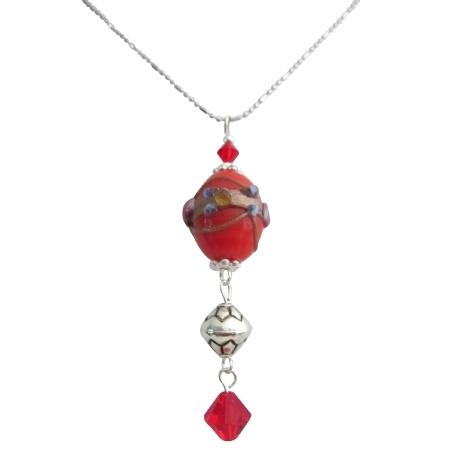 Artisan hand created jewelry with handmade ethnic bead decorated accented silver chain.